The 370Z Coupe is offered in two models for 2011, 370Z and 370Z Touring, each available with a standard 332-horsepower 3.7-liter DOHC V6 engine and choice of 6-speed manual transmission or a 7-speed automatic transmission. The changes for the 2011 370Z are limited to the addition of RearView Monitor to the optional Navigation Package and one new exterior color, Gun Metallic. 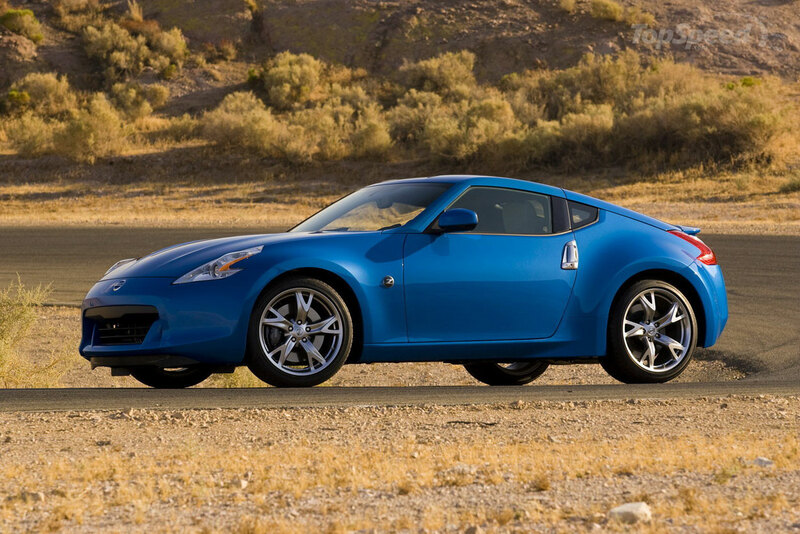 In addition to the 2011 Nissan 370Z Coupe, an open-air 370Z Roadster and 350-horsepower NISMO 370Z are also available (full information on both models available separately – see Nissannews.com). The 2011 370Z Coupe’s dynamic styling offers dual benefits – an aggressive appearance and a light, highly rigid structure for enhanced performance. The 370Z Coupe’s 2nd generation FM platform provides a refined foundation for the well-proportioned body, with a 100.4-inch wheelbase, 167.2-inch overall length, 72.6-inch width and 51.8-inch height, giving it a classic sports car look and feel. The Z® features aluminum door panels, along with an all-aluminum hood and an aluminum hatch. The body structure was extensively revised for this generation design, improving front body torsion rigidity by 30 percent and adding a front suspension cradle to help reduce front body lateral bending, rear structural reinforcements, and an underbody “V-bar” to help reduce rear lateral bending. The design also uses a carbon fiber composite radiator housing and strengthened rear fender and hatch areas. The 370Z’s taut exterior design incorporates intentional 240Z styling cues, a sleek aerodynamic shape, a “dynamic motion” feel with a dramatic cantilevered roof and a “low visual gravity.” The sleek silhouette is defined by its upswept quarter window design that is echoed by the dynamic upward curvature in the lower rocker panel and the sense of the taut sheet metal molding itself around the wheels and frame. on/off feature are standard. The intense broad-shouldered rear shape is highlighted by the integration of the boomerang taillights and wide, flared rear fenders. Attention to detail and functionality is evident throughout the exterior design, including a flashing (repeater lamp) side marker lamp/emblem. Performance body pieces are available as part of the optional Sport Package, including a front chin spoiler and rear spoiler. The 2011 370Z is offered in seven exterior colors: Pearl White, Monterey Blue, Brilliant Silver, Magnetic Black, Solid Red, Gun Metallic and Black Cherry. The interior of the 2011 370Z Coupe continues the Z® tradition of enhancing driving pleasure. The traditional 2-seat layout is built around a deeply scooped instrument panel with a full-length center console separating the driver and passenger’s seat. In the rear is an open cargo area with ample storage and accessibility. The design focus incorporates a “layer concept,” with an information layer, an operation layer and a holding layer. The information layer provides good visibility with easy access to all key data. The gauges are attached to the steering column, so the driver doesn’t have to choose between their preferred steering wheel position and visibility of the gauges. The large upper steering wheel opening in front of the gauges is designed to provide a good view of the readouts. The instrument panel retains the traditional 3-pod cluster with oil temperature, voltmeter and clock, while the speedometer and tachometer include an “initial sweep” function, coming alive when the Z® is first started. stitching and large thumb grips and palm rest areas for improved feel on long drives. The surface of the leather-wrapped wheel is “shaved” to provide a more kidney-like shape to better fit in the hand. The manual transmission shifter is padded in different areas to improve the accuracy of diagonal shifts and to feel softer in the hand for forward and backward motions. The holding layer includes the seats, knee pads and door trim support. The driver’s seat is uniquely different from the passenger’s seat, with lower seat cushion cut-outs on the sides where the thighs rest – allowing the driver to push on the pedals without the seat fighting them. The seat frame is constructed to help hold the driver in place during cornering. Both the driver and passenger’s seats are structured with an anti-slip material in the main seating surface. The sporty woven cloth seats feature standard 8-way driver’s/4-way passenger manual adjustments, with heated 4-way power-adjustable leather-appointed seats standard with the 370Z Touring model. Adjustable front seat Active Head Restraints are also standard. The interior features standard Black cloth. Nissan 370Z Touring models include a choice of Gray, Black or Persimmon leather-appointed and synthetic suede seating. The door armrests have been designed to provide extra support when cornering and the kneepads are integrated to help the driver maintain the proper position while cornering. Standard interior comfort and convenience features include Nissan Intelligent Key™ with Push Button Start, power windows with one-touch auto up/down feature, power door locks with auto-lock feature, a center console box with a non-intrusive cover design, automatic climate control, rear window defroster with timer, two 12-volt power outlets, three cupholders, dual overhead map lights and a AM/FM/CD/AUX 4-speaker audio system with illuminated steering wheel-mounted controls. Also available is the Nissan Hard Drive Navigation System with 7-inch VGA touch-sensitive display, 9.3GB HDD Music Box, USB connectivity and iPod connection, XM NavTraffic with Real-Time Traffic Information and XM NavWeather™ (XM subscription required, sold separately), automatic phonebook download (select phones), Bluetooth Streaming Audio and Rearview Monitor. The Pure Performance of a 332-horsepower V62011 Nissan 370z Coupe vq37vhr v6 All 2011 370Z Coupes utilize the fourth generation of Nissan’s award-winning VQ-series V6. The 3.7-liter VQ37VHR engine with VVEL (Variable Valve Event and Lift) is rated at 332 horsepower @ 7,000 rpm and 270 lb-ft of torque @ 5,200 rpm. Key to the outstanding performance is the VVEL system, which is able to optimize intake valve open/close movements, allowing the needed air to be sent promptly to the combustion chamber at the precisely optimized time. Since the VVEL system can adjust to open the valves slightly, it improves fuel efficiency by reducing camshaft friction and fuel waste. It also provides cleaner emissions by allowing for quicker warm-up of the catalyst and by stabilizing combustion when the engine is cool. 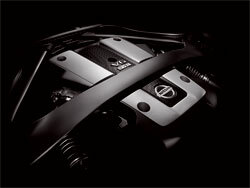 The engine is backed by a choice of two advanced transmissions, both designed to improve driver performance. The close-ratio 6-speed manual includes an available synchronized downshift rev matching system, which allows drivers of any skill level to experience professional-like gear shift performance. The SynchroRev Match™ function automatically controls and adjusts engine speed when shifting to the exact speed of the next gear position, essentially “blipping” the throttle to smooth out any up/down shifts. This not only allows the driver to focus more on braking and steering, it improves the smoothness of gear shifts by reducing the typical “shock” when the clutch is engaged. The system can be deactivated with a button next to the shifter for drivers who prefer to shift on their own. The SynchroRev Match™ system is offered as part of the optional Sport Package. The 370Z’s 7-speed automatic with Downshift Rev Matching (DRM) and Adaptive Shift Control (ASC) is designed to offer quick, manual-like shifting when operated in manual mode with a target time of 0.5 seconds between shifts. Drivers can use the standard paddle shifters or the shift lever. With optimized torque converter lock-up logic, the 7-speed automatic feels very direct, like a manual transmission. The 7-speed’s wide gear ratios offer improved fuel efficiency (versus a 5-speed automatic), while the Adaptive Shift Control is designed to adjust to the driver’s driving style. The standard 370Z wheel and tire package features 18x8.0-inch front/18x9.0-inch 5-spoke lightweight aluminum-alloy wheels with P225/50R18 front/P245/45R18 rear Yokohama ADVAN Sport high performance summer tires. Also available as part of the optional Sport Package are 19-inch RAYS forged lightweight aluminum-alloy wheels with Bridgestone Potenza RE050A P245/40R19 front/P275/35R19 tires. The 2011 Nissan 370Z’s long list of standard safety and security features includes the Nissan Advanced Air Bag System (AABS) with dual-stage supplemental front air bags with seat belt sensors and occupant classification sensor; front seat-mounted side impact supplemental air bags; roof-mounted side-impact air bags; seat belts with pretensioners and load limiters, Active Head Restraints, Zone Body Construction with front and rear crumple zones, Nissan Vehicle Immobilizer System, Vehicle Security System and Tire Pressure Monitoring System (TPMS). 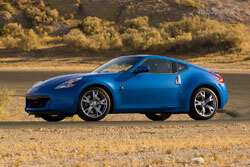 The 2011 370Z model line-up consists of two models – 370Z and the 370Z Touring – and two available packages. Along with the long list of standard features of the 370Z, the 370Z Touring adds heated leather-appointed and synthetic suede power seats, adjustable lumbar support, HomeLink® Universal Transceiver, Bluetooth® Hands-free Phone System, 8-speaker Bose® audio system, XM® Satellite Radio (XM® subscription required, sold separately), auto-dimming inside mirror, cargo cover and aluminum-trimmed pedals. The optional Sport Package features 19-inch RAYS forged wheels and Bridgestone Potenza tires, aerodynamic front and rear spoiler, larger Nissan Sport Brakes, SynchroRev Match™ (6-speed manual transmission only) and Viscous Limited Slip Differential (VLSD). 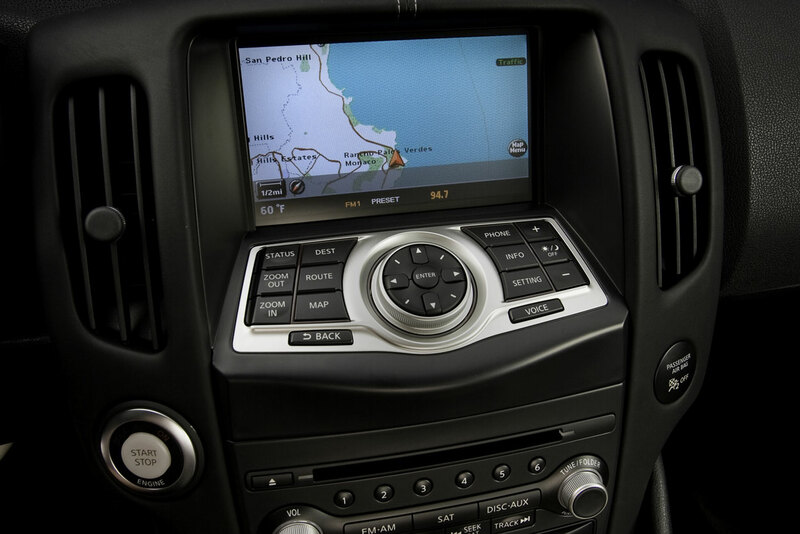 The Nissan Hard Drive Navigation System features a 7-inch VGA touch-sensitive display, 9.3GB HDD Music Box, USB connectivity and iPod connection, XM NavTraffic with Real-Time Traffic Information and XM NavWeather™ (XM subscription required, sold separately), automatic phonebook download (select phones) and Bluetooth Streaming Audio. 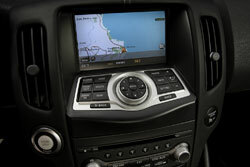 A RearView Monitor has been added to the Navigation package for 2011. *Vehicle’s projected resale value is specific to the 2010 model year. For more information, visit Kelley Blue Book’s kbb.com. 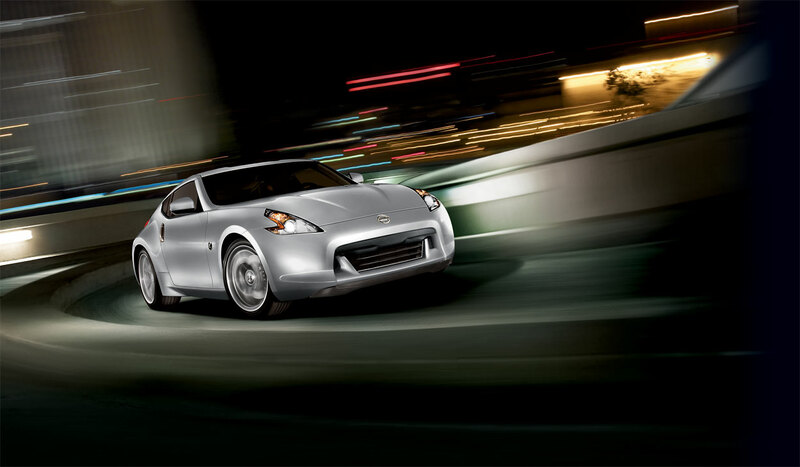 **The 2010 Nissan Z® is winner of a Consumers Digest Best Buy Award.